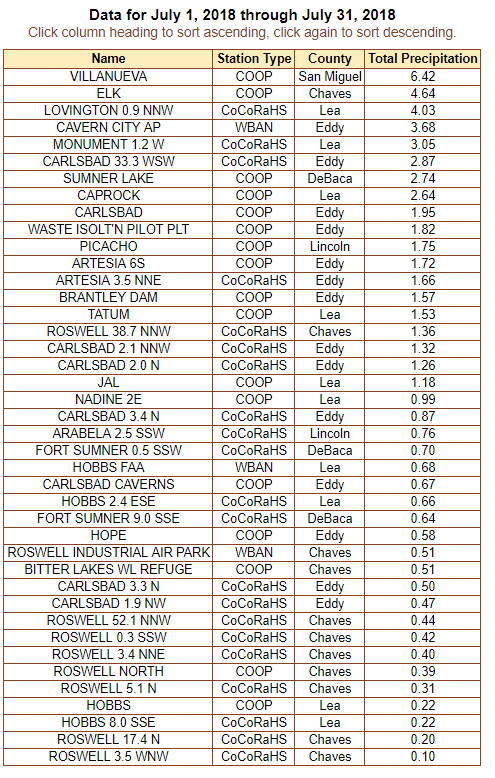 SE NM July 2018 Rainfall Totals. Between Mayhill & Cloudcroft - July 14th, 2018. Mist Often Hugs The Mountainsides After A Summer Rain. SE Plains July 2018 Rainfall Totals. Guadalupe Mountains Raws July 2018 Rainfall Totals. Lincoln County July 2018 Rainfall Totals. 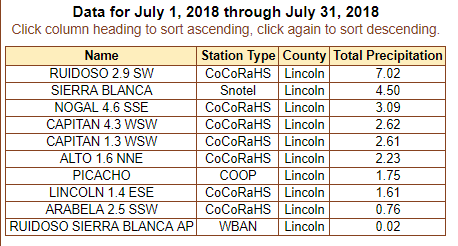 Lincoln County Raws July 2018 Rainfall Totals. 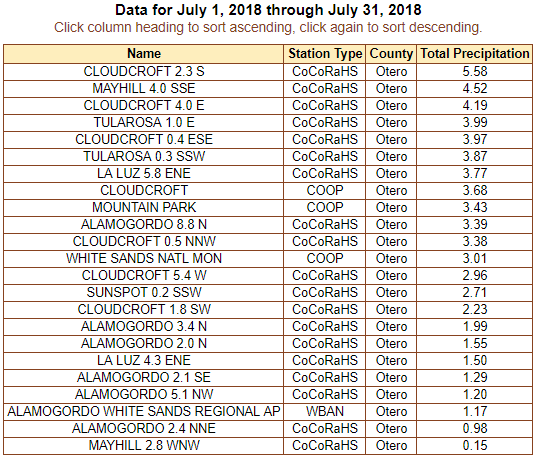 Otero County July 2018 Rainfall Totals. Our annual summer Monsoon kicked in a couple of weeks early (last week or so of June) over much of New Mexico this year. Goods news for most us too. Its been a slow climb upwards towards getting back to our normal or long term average rainfall totals. July was impressive in both ways...meaning that locally we saw a few locations receive above normal rainfall while many are still below normal both for the month and year-to-date. Smokey Bear Raws - Ruidoso 5.60"
Bowl Raws - Guadalupe Mtns Natl Park 4.83"
Elk - East Of Mayhill 4.64"
Meanwhile on the northwest side of Carlsbad (and only 6 miles north-northwest of the Carlsbad Airport) I finally managed to squeeze out 1,32" for the month. The Hobbs Climate Co-Op Station only measured ,22". The Hope Climate Co-Op Station only measured .58"and the Roswell Airport .51". As I have stated several times this summer the theme for our rainfall pattern so far has been "hit and miss".